I like these muffin liners. I like that they can stand on their own, that I can fill one or twelve with batter, bake off as many or as few muffins as I like. 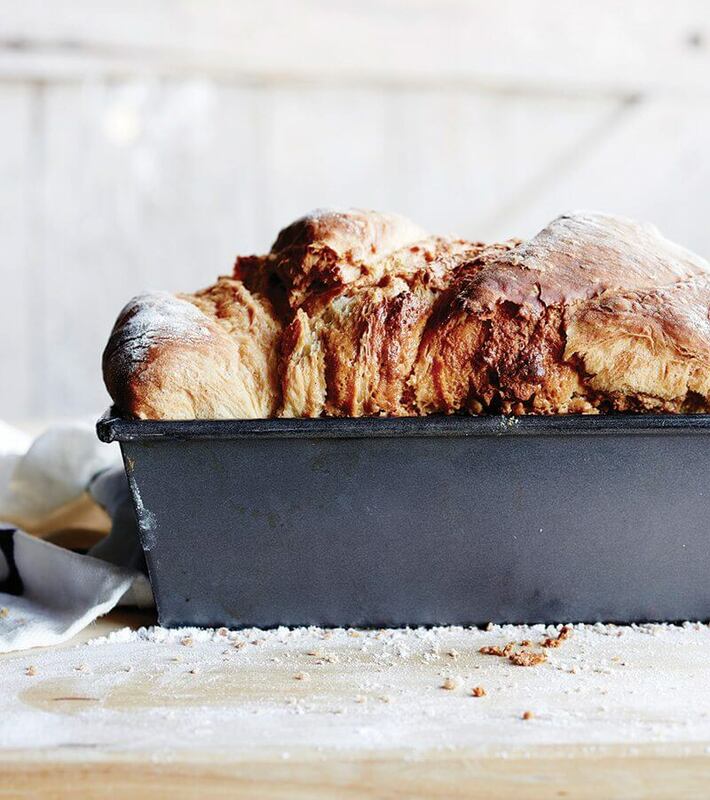 I like their shape — that they create straight-sided panettone-style loaves. I like peeling away the paper from the baked muffin, unveiling the straight sides, and I like scraping with my teeth every last morsel left clinging to the bottom round. And I like — I love — that they remind me of my first few years of being in Philadelphia, when I lived just steps from Metropolitan Bakery, where I first discovered these liners wrapping so many delicious breakfast treats, namely millet muffins, my favorite. As much as I like these pretty paper wrappings, I can assure you they are optional, merely for creating that coffeehouse baked-goods effect. 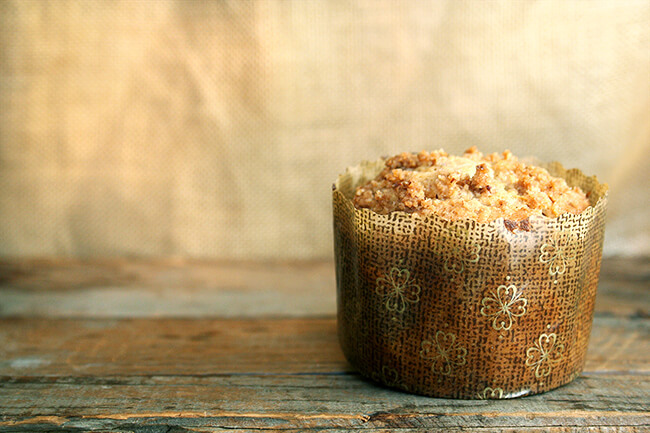 I can assure you that I like what these pretty paper wrappings hold even more, especially when it’s in the form of these coffeecake muffins, a Cook’s Illustrated recipe that never fails to please. A dear friend’s husband, a private chef, in fact, tipped me off about this recipe several years ago, and I have made it countless times since. With or without a pretty paper wrapping, these muffins, made with a cinnamon-pecan-brown sugar streusel mixed into a sour cream batter, capture the spirit of breakfast treat. It’s the weekend everybody! Woo-hoo! Brew some coffee. Make some muffins. Pretend you’re at your favorite café. You won’t be sorry you did. Don’t be tempted to fill these liners too high. The batter will overflow and burn on your oven floor. One scoop (standard-sized ice cream scoop) works just fine, and the batter will still climb above the tops of the liners. Notes from the Magazine: Be careful not to overprocess the batter in step 4. If you don’t have a food processor, first chop the nuts with a knife. 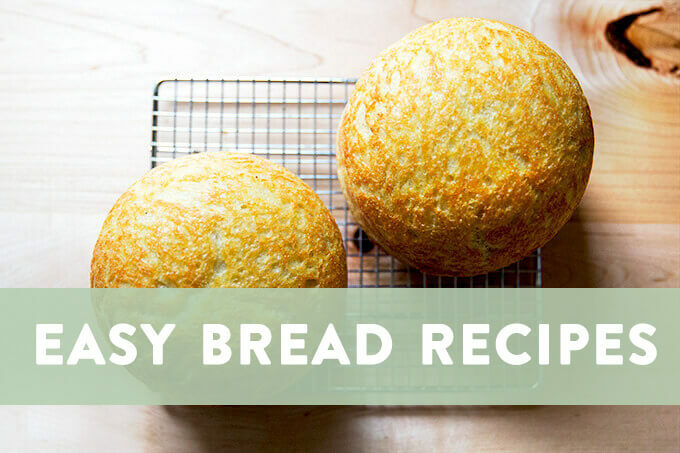 Proceed with the recipe, mixing the ingredients in a large bowl with a wooden spoon or spatula, but use a wire whisk to work the butter into the dry ingredients in step 3. 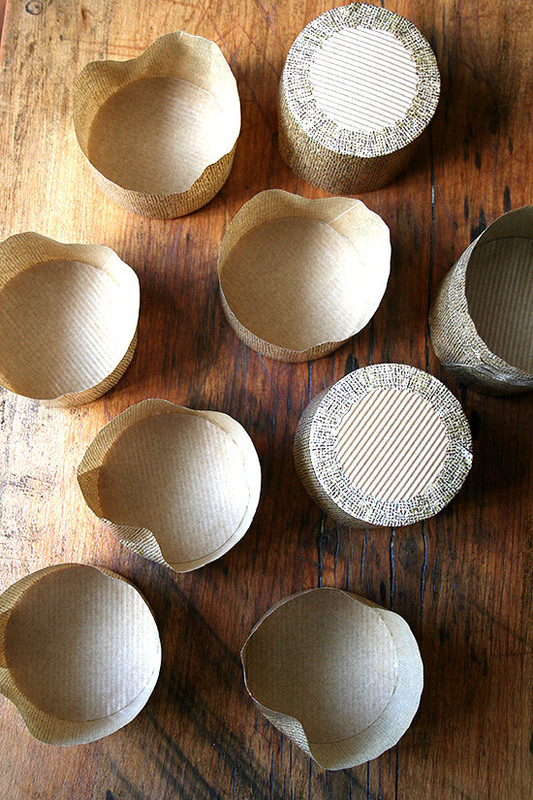 My Notes: I made the batter the night before and baked off the muffins in the morning using these pretty coffeehouse-style muffin liners. Adjust oven rack to middle position and heat oven to 350 degrees. Grease 12-cup muffin tin and set aside. Process nuts, brown sugar, and cinnamon in food processor until nuts are size of sesame seeds, about ten 1-second pulses. Transfer mixture to medium bowl. Add baking powder and baking soda to remaining flour mixture in food processor bowl and process until combined, about five 1-second pulses. Whisk together sour cream, egg, and vanilla; add to flour mixture. Process until batter is just moistened, about five 1-second pulses. Add 3/4 cup reserved streusel to flour mixture and process until streusel is just distributed throughout batter, about five 1-second pulses. 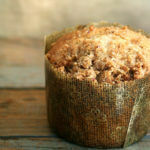 Divide batter among 12 muffin cups and sprinkle with streusel, pressing lightly so that streusel sinks slightly into batter. Bake until toothpick inserted in center of muffin comes out with several crumbs clinging to it, about 18 minutes (mine took more like 25 minutes, but start checking after 18 min), rotating pan from front to back halfway through baking time. Cool muffin tin on wire rack for 2 minutes. Using tip of paring knife, loosen muffins and gently transfer from tin to wire rack; cool for 5 minutes and serve warm. 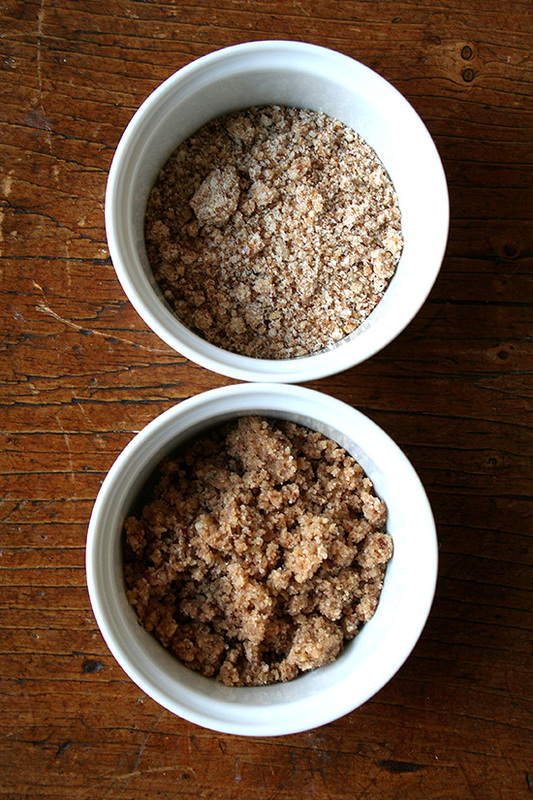 Top ramekin: Crumb topping as made with original recipe. Bottom ramekin: Crumb topping made with an additional tablespoon of butter — the additional tablespoon of butter helped create a better-textured crumb in my opinion, but this step is optional. The muffins are delicious no matter what. These muffins look delicious! I just discovered your site and have to compliment you, it looks great and the pics are so beautiful! Hi Dorothea — Thanks so much for writing in. I’m so glad you are having success with the ABin5 recipe! I imagine it must have been very hard moving from the Netherlands, and I’m glad you’ve found a solution for your bread supply. 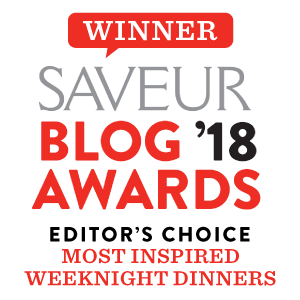 I recently started baking off mini loaves of the ABin5 recipe in buttered ramekins and am loving it — it’s fun when everybody has their own little loaf to enjoy at dinner. It’s a nice change from making big loaves. Anyway, thanks again for writing in! Oh these have just been added to the list of things to make this weekend! So glad it’s a long one. And the lingers are super cute! 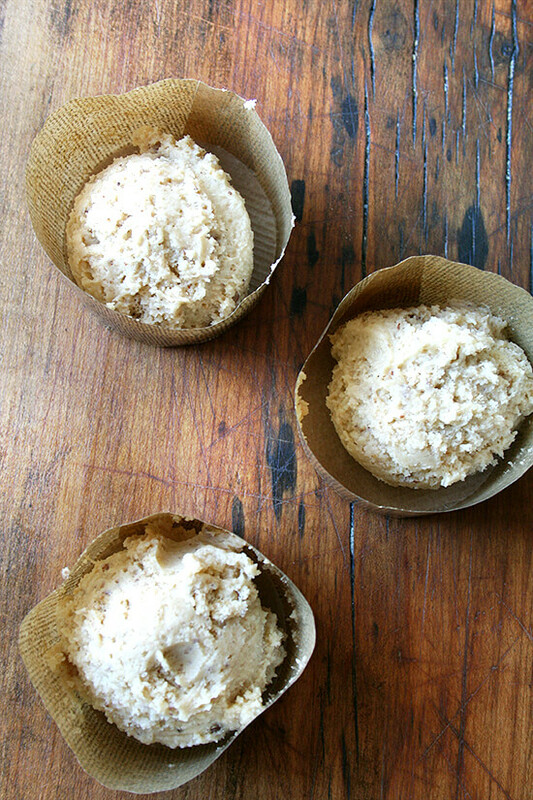 After experimenting with “healthy” muffins, I think I really need to make these. The streusel topping just looks too good. I have been adding apples to my muffins lately, do you think it would work with these, too? Lena — I think apples would be a lovely addition to these muffins! I love apples in muffins, and these muffins have already have cinnamon in them, which of course is such a nice complement to apples. Report back if you make any discoveries! I’ve always liked a good coffee cake, but never ventured out to make my own. and your wrappers are so cute. Thank you! Thanks to you, I made Alta’s crispy brussels sprouts this afternoon. Yum! You’ve just scored a new follower!! Alice — So glad to hear this! I need to revisit those Alta brussels sprouts… it’s been too long! I love the look of the wrappers….just as lovely as those muffins! how did you know I’m in a coffee cake place of mind these days? I neeeeed it. So much for those new years resolutions. And yes your streusel looks way better with the extra butter, so I will certainly follow your lead on that. Have you made a cake with this recipe? I don’t have muffin tins yet (must hunt for cute muffin cups). lovely photos as always! hope you had a great holiday, it certainly looks like you made a bunch of delicious treats to keep the elves happy. Alexandra – I just made them and added 3/4 of an apple, coarsely grated. I don’t know how they would have turned out without the apple, but they are delicious! 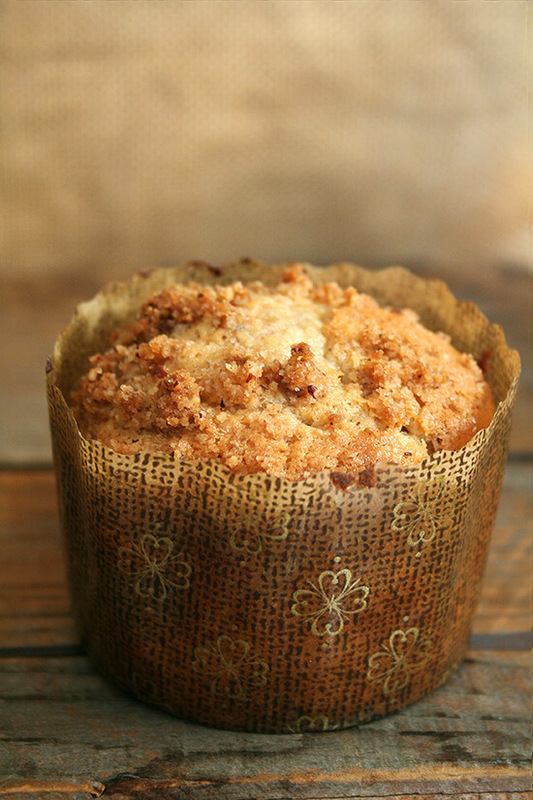 Love the streusel topping, I have some leftover and I really have to keep myself from eating it all as it is. Thanks for sharing! Lena, thanks so much for reporting back! Grated apple sounds like a fantastic addition. Healthy, too! I’m going to try that next time. Thanks for the reply Alexandra! 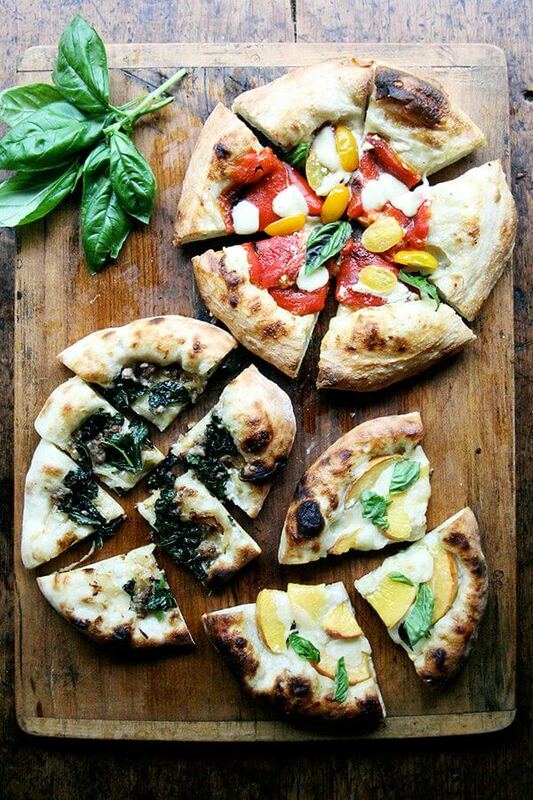 Just wanted to let you know I tried the dough last night for pizza and…it was amazing!! I couldn’t get over how great it tasted, I have lots of other ideas for the dough, like onion and cheese bread mmm…! So glad to hear this Dorothea! I know, the possibilities are endless! I need to make another batch of the pizza dough, too. Thanks so much Javelin Warrior! I’ll go check it out right now. I´m a new follower and i love your site. This recipe is lovelly and i love to bake muffins for my three kids so this is just perfect for them. Thanks for writing in, Rita. I hope your kiddies like the muffins. If they taste as good as they look I will be one happy mama! Your photography is great! 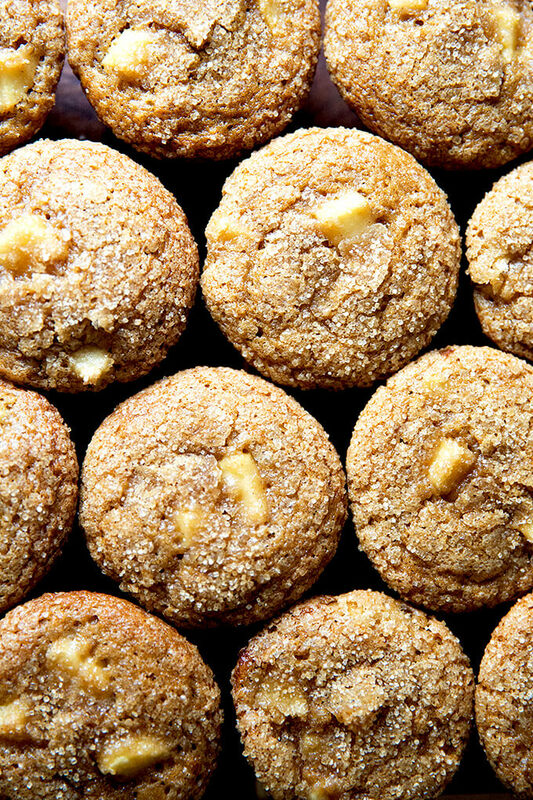 All I can say is that I wish I could push my hand through my monitor right now and grab one of these muffins to bite into. AMAZING! This recipe is great except I wish you had made it clearer which part was the streusel. I didn’t see anywhere to “set aside” the bowl with the brown sugar and ended up mixing it in. 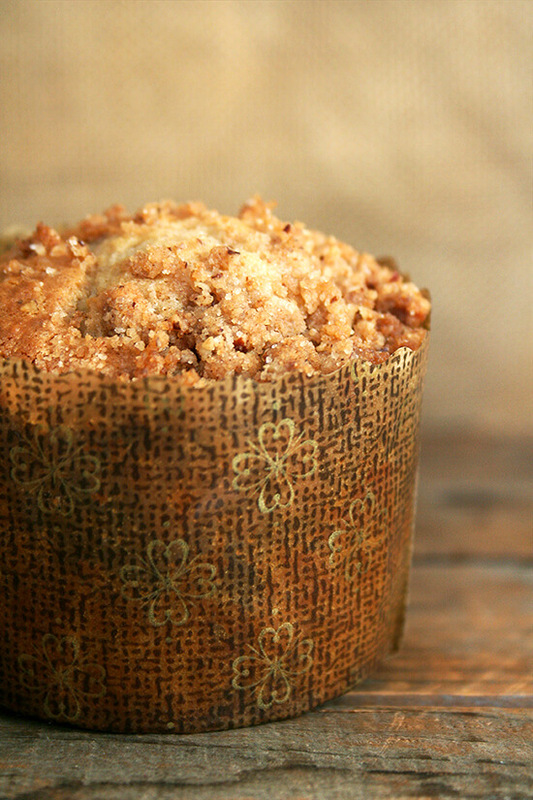 Still, even if there had been no streusel at all, these have amazing flavor and moisture. I left the recipe just as it was written in Cooks Illustrated, but whenever I make this recipe, I have to really make sure I have all of my ingredients laid out, and I have to read it a hundred times to make sure I set aside portions at the appropriate steps. I’m sorry it gave you some trouble. Is there really a step missing about setting aside the bowl with brown sugar? I need to fix that if that is the case. Hi! Super excited to try for my daughters birthday/brunch. Do you think I could make the batter 2 days in advance?? Katie — yes, definitely! I make muffin batter one day and eat it over the course of a week with no difference noticed. 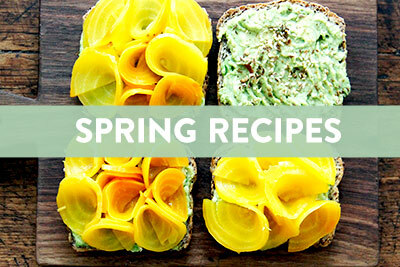 Just a heads up — this recipe is kind of annoying. 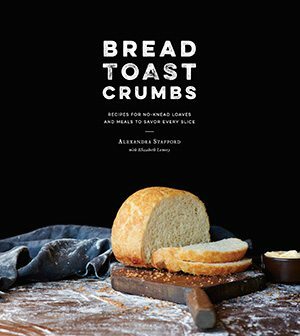 In true Cooks Illustrated fashion, they are very precise, but you’re constantly having to set aside portions at each step of the way in this recipe, so it really helps to have ALL of your ingredients measured out ahead of time, and to have bowls handy for setting aside streusel topping, etc. Hope that helps! Just wanted you to know I made these muffins and they are over the top, we’re all in love with them. I’ve even had a few privileged friends who got to try one ask to buy some! Here’s the post I wrote, thanks so much for sharing! Joan, this makes me so happy! Thanks for writing in. I’m going to check out your post right now! Love these beautiful muffins. Could you possibly email the recipe to my address? My computer is down right now and I’m at the library. Would love to do this recipe at a later date. I also love the muffin wrappings. A link to that would also be appreciated. Where does one buy the muffin paper wrappings just like the bakery? I’m am definitely making these muffins! 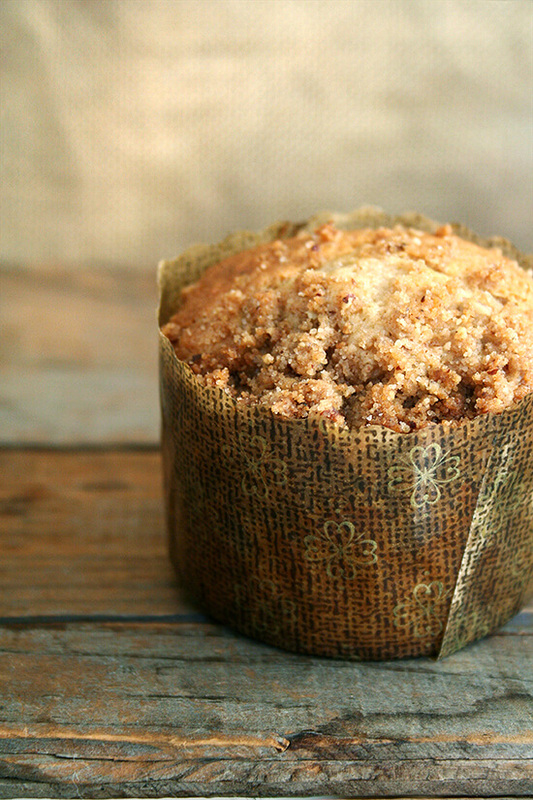 Doris — Amazon of course: coffeehouse muffin liners. Hope they turn out well for you! Logan, you are too kind to say such things! I have just the recipe for you. I am going to email it to you now. Happy Baking! Made this recipe today…..YUM! Used regular muffin liners (yielded 15 muffins) and omitted the pecans because I dislike them. Also made another substitution–only had about 1/2 of the required sour cream in the fridge, so I kept adding milk to the mixture until the consistency seemed okay. Turned out great! 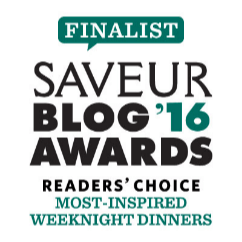 Carla — wonderful to hear this! I am not a huge pecan fan either, so I’m glad you discarded them. I made some raspberry crumb bars today, and I replaced the crushed pecans with almonds. Glad to hear milk worked out just fine, too. I love these muffins, too. Must make them again soon! Hi. I just found your website. It is lovely. I just made these muffins and they are delicious! This will be my go-to weekend brunch muffin. You have a great website and I enjoy the level of detail you provide. Thanks! Oh, so happy to hear this, PJ. These are one of my favorites, too. So glad you liked them!